1. Heat the butter in a large saucepan. Add the onion, parsnips and potatoes and gently cook for 15 minutes, stirring occasionally to ensure they don’t stick. Add the garlic and cook for another 2 minutes. 2. Add the bay leaf and stock, bring to the boil and simmer for 15 minutes until perfectly tender. 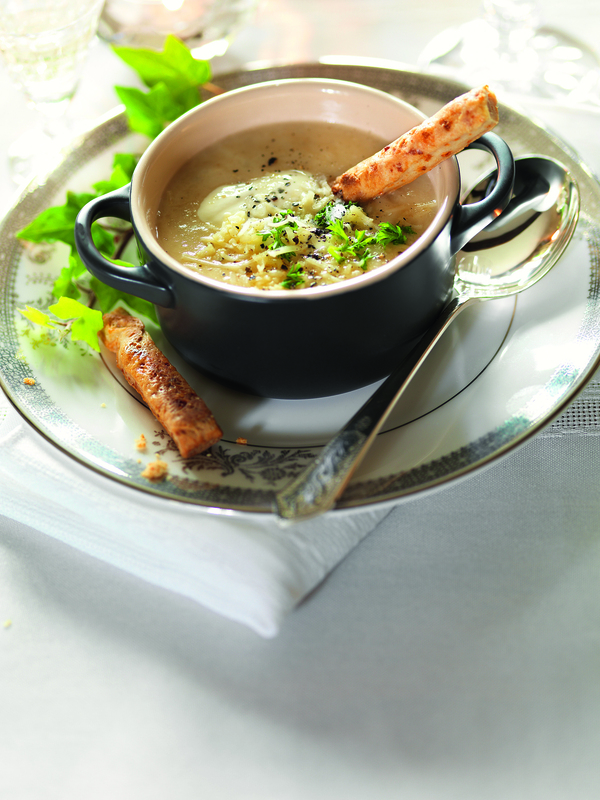 Mash until slightly chunky, or whizz with a stick blender for a smoother soup. Stir in 4 tbsp of the crème fraiche, the parsley and half the Cheddar. Check the seasoning and add an extra splash of boiling water if you feel the soup needs thinning a little. 3. To serve, spoon into little cups arranged on saucers and top with the remaining crème fraiche, a little extra parsley and the rest of the Cheddar. Serve immediately with savoury cheese straws.